A Pneumatic tire forklift is a machine that is primarily used to lift various load capacities. Most load capacities sit between one and five tons, but some heavy-duty machines lift up to 50 tons. Pneumatic tire forklifts are used for Warehouse Lifting, Manufacturing, Distribution, Construction, Demolition, and Military. The loads of Pneumatic tire forklifts are rated to determine maximum weight and center of gravity. The rated information is located on a data plate, and it is illegal in many locations to remove the plate or lift over the maximum weight. This is a safety function of forklifts as they could become unstable and tip over if the weight limit is exceeded. Forklifts can also tilt to protect the load from the risk of slipping. Pneumatic tire forklifts have a truck frame on tires similar to that of a car. Pneumatic tires have air in them and are larger than cushion tires. Because of this, pneumatic tires are more suited for outdoor work on asphalt, gravel, and other unstable surfaces. At the rear of the forklift is a counterweight that protects the cab from falling forward under the weight of the load, and on top of the forklift is an overhead guard that protects the operator from falling objects. The mast is the vertical assembly that raises and lowers the load. It is operated by hydraulic cylinders. 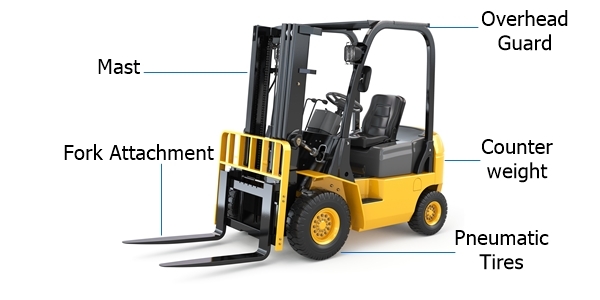 Pneumatic tire forklifts also have attachment options. While some come with the forks permanently attached, others can be changed. These attachments include: sideshifters, carton clamps, rotators, carpet poles, container handlers, and pole handlers. Pneumatic tire forklifts have a strong grip and are popular in rough terrains in locations such as construction sites, lumber yards, and outdoor warehouses. In comparison, Pneumatic tire forklifts have the smooth surface tires that have a better turn radius for smaller spaces and better traction for indoor locations. 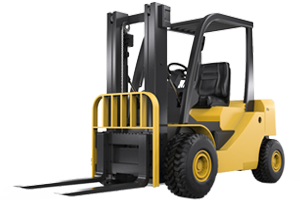 There are several popular manufacturers of Pneumatic tire forklifts including Toyota, Hyundai, Hyster, Cat, and Nissan.